Yo ho ho! When one's a sea-faring Pierateer such as myself, where does one go for some lovely PIE in Broadstairs, Kent? Well listen in, and I'll tell ye a yarn. Joss Snelling and his infamous gang have got a smugglin' cave right there in them cliffs, look. That's where they store their smuggled goods. But you know what's better than smuggled tea, wine and contraband? Pies. And look above the cavern, on top of that cliff. 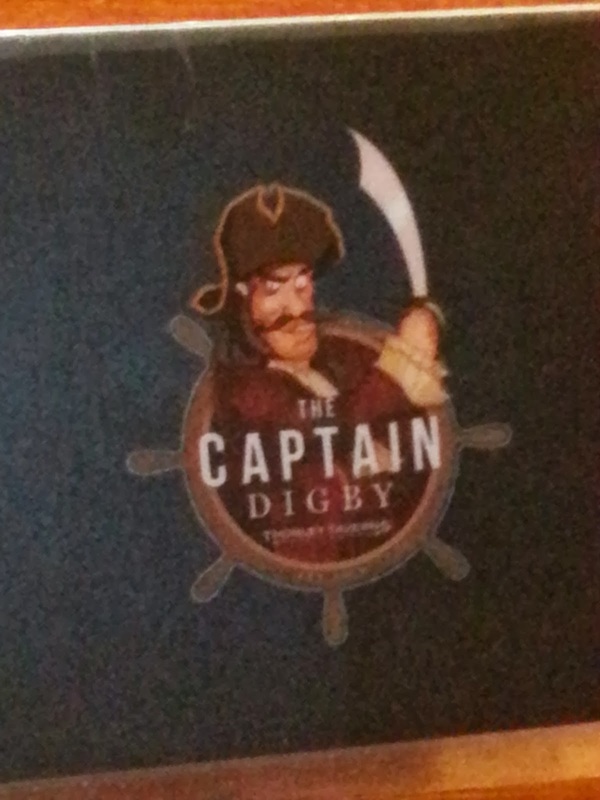 Yes, it's Captain Digby, and he does some fine pies I hear. Captain Digby's. It's where any Pierateer worth their salt knows to visit. You don't sail the Seven Cs and live to tell the tale, and then not go to Captain Digby's. Especially when he's brandishing such a fine sword, and there's several types of pie on the menu. We've said it before, and we'll say it again, this is not a pie. It is a stew in a dish with some pastry on top. Apart from the slight contact the stew makes with the pastry, there is nothing about this that fits the definition of a pie. Even those around me, who weren't quite so acquainted with the pie rules, seemed stunned and disheartened by the ease at which I could lift the lid on this pie. Clocking up a bill just south of £11, this is also an expensive pie, in my view. And it's not even a pie. 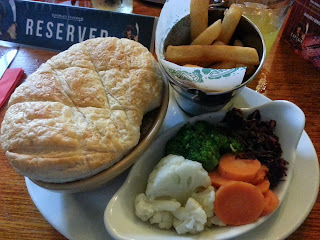 It did come with some (fairly standard) veg, and chips in a little bucket (why do they always do that?) - and was actually a very sizeable meal - but I think this pie is still in the very high price bracket for what you get. But how did it taste? 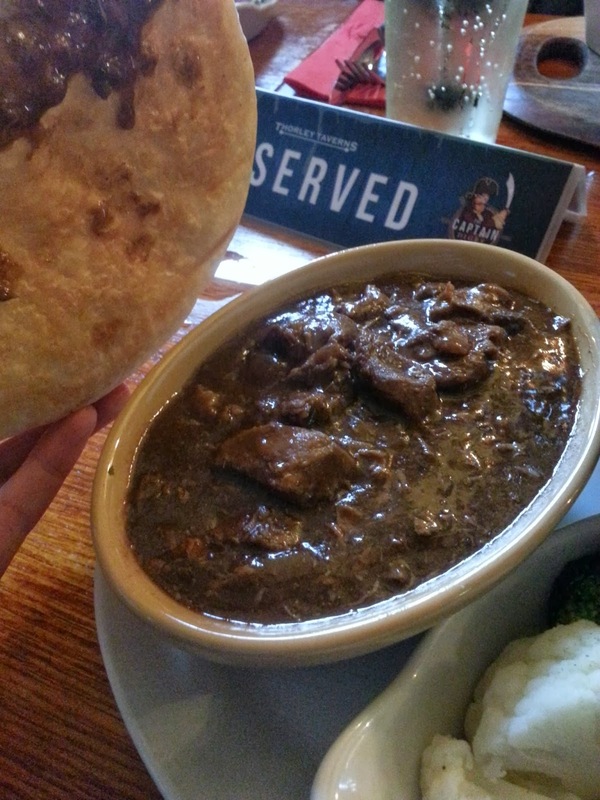 The stew was nice, and the steak of good quality with nice chunks that weren't chewy. I felt the stew was quite salty, however, and really rather liquid (would have been very gooey in a fully-encased pie). I appreciate that it's also definitely easier to make this sort of "pie", because you can batch make your stew, batch make your pie lids, and then just put the two together when the pie leaves the kitchen (I'm not saying this is what Captain Digby have done here, because I don't know, but I'm imagining the possibilities). I really enjoy the skill that goes into making a fully-encased, individual, autonomous pie, with it's own little microenvironment inside. This sort of pie just isn't the same to me. Overall, this pie was of good quality but lacked character and charm, was too salty for my liking, expensive, and a top-crust. The real acid test is: would I buy this again? And I probably wouldn't, sorry. Great view from the pub terrace, though.